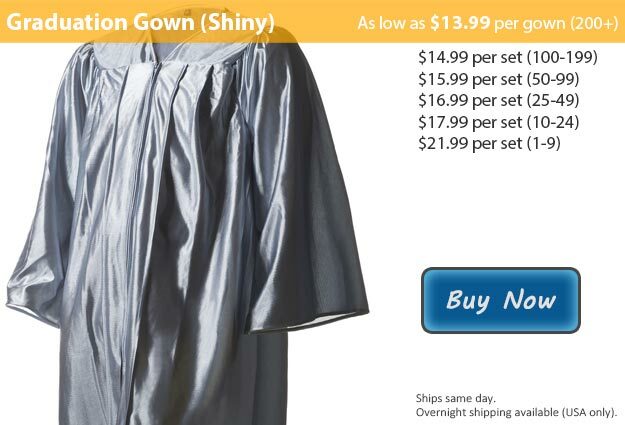 Shiny silver graduation gowns are a marvelous way to go, they look absolutely stunning with any combination of the accessories that we have available.Graduation gowns often reflects either your degree or your schools color. Our shiny silver graduation robes are a marvelous way to go, they look absolutely stunning with any combination of the accessories that we have available. Our goal here at Honors Graduation is to help graduating students look their best for this monumental day in their life. You have dedicated countless hours these past years to get to where you are today. Though you were focused on your studies and overcoming the obstacles in your path, I'm sure that you managed to make a few friends along the way as well. Graduation is the time when your friends and family come together to join you in celebration. Your graduation is a celebration specifically intended to honor you for all of the hard work that you have done in order to reach this level of success. It is important to dress the part as this chapter closes and your next adventure begins. Graduating students wear a graduation robe and cap during their ceremony, most of the time accented with cords, a tassel, and even stoles. Silver or grey gowns represent degrees in veterinary science as well as communication studies. We offer a bundle deal that includes your robe and matching cap, plus we will add a tassel in whatever color you want for free! We have our Cap & Gown + Tassel deal for quick and convenient shopping, however each of the items available from our inventory is also available for separate purchase as well. We have a large number of graduation robe sizes in stock, ranging from 24-66 including multiple plus sizes. If you purchase your cap from Honors Graduation we will throw in the tassel of your choice at no additional cost to you. Each of our shiny graduation gown colors are also available in matte finishes as well. This graduation robe is also available in Silver Matte Fabric.